[Guest Post] 46% of Visitors Judge Your Landing Page on Looks Alone. Here’s What to Do About It. Editor’s Note: We’re pleased to introduce this guest post by Marc Aarons. Marc is the founder of 80/20 Solutions, where he helps online businesses, research, design, launch and sell premium digital products and services. Today, he’s sharing his thoughts on making design choices on your landing page that enhance both your credibility and your conversion rate. For more info, Marc’s also created a 6-Point Landing Page Design Cheatsheet, available for download. It doesn’t matter whether it’s LOLcats, your competition, or your prospect’s baby sneezing because it’s pollen season. If you lose a prospect’s attention anywhere between the landing page and the order page, the sale is gone. To make things worse, according to a 2013 study by Microsoft, you’ve got 8 seconds before your prospect starts thinking about what’s for lunch. It doesn’t matter if you’re spending over $10,000 a month on Facebook ads or 20 hours a week on a mega guest post to generate a flood of leads. If prospects get distracted in your funnel, it’s like having them roll into your McDonald’s drive-through . . . ponder on what to munch on . . . then hit the gas without even buying your 2-for-$1 apple pie. If you’re trying to cut lead acquisition costs, optimize your sales funnel, and grow revenue, there’s only one real way to beat distraction into the dust. But what exactly is media? Your landing page is media. Your website is media. Your copy is media. Everything you show your prospect? But not all media are created equal. In the world of limited budgets and even scarcer time, winning the game of leverage means optimizing for attention and conversion with the biggest guns in your arsenal. As it turns out, the heaviest ammunition you’ve got can’t even be put directly on your landing page. The #1 Way To Keep Your Prospects’ Attention? You write copy that describes your prospects’ fears and frustrations, wants and aspirations so well they immediately believe you have the solution. Or, better, you create an irresistible offer so compelling, people opt in and buy without even reading your copy. Or, even better, you do both. If this is ALL you did—hey, you’re probably doing a good job of maximizing your Facebook ad spend and organic lead generation. But what if there was another lever that could increase conversions before site visitors ever read your copy or saw your offer? And what if that same optimization point, if ignored or done poorly, could completely tank your credibility? 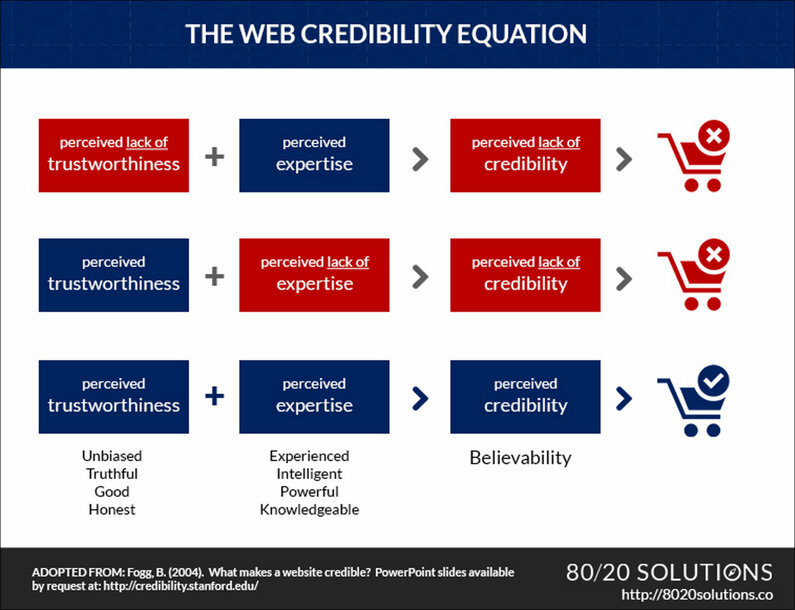 That’s exactly what scientists at the Stanford Persuasive Technology Lab accidentally discovered when they teamed up with a division of Consumer Reports to study web credibility. 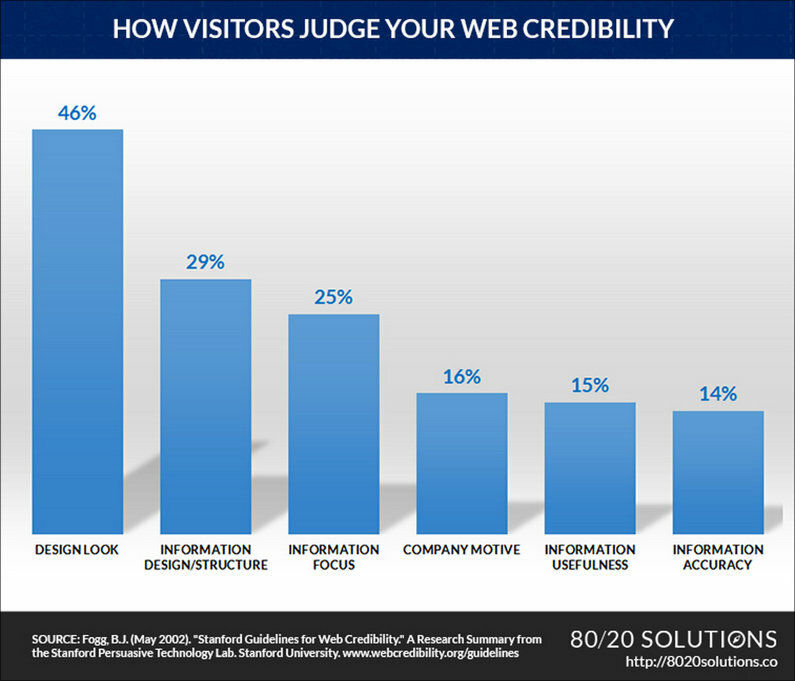 After combing through the research data—which came from 2,684 participants across 100 websites in 10 different niches—they discovered the top 18 factors people use to judge a website’s credibility. But what they found . . . kinda killed their vibe. So, how then did folks judge a website’s credibility? 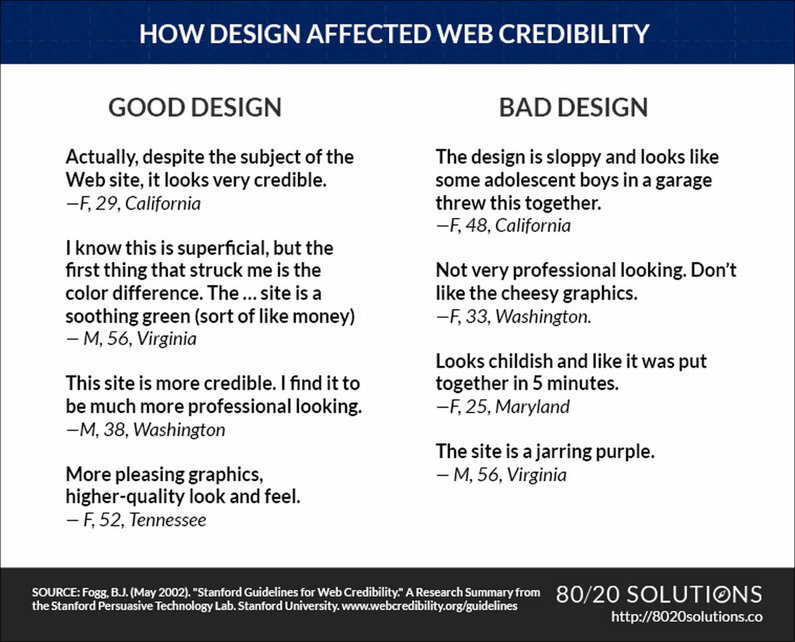 “We found that when people assessed a real Web site’s credibility they did not use rigorous criteria . . . The average consumer paid far more attention to the superficial aspects of a site. Sad truth: Lots of people only care about your looks. Sadder truth: People don’t care about your personality. While this might not restore your faith in humanity anytime soon, there is a bright side for online businesses with great design, powerful copy and a strong offer. Take-home message #1: If copywriting is king, then landing page design is the castle. Could Beautiful Design Hurt Conversions? Those are words from a manifesto by Conversion Rate Experts, the guys who Google, Facebook and Amazon turn to for split-testing advice. After working to improve many of the world’s top 500 websites, they found out that websites and landing pages can look so good they distract from your conversion goals. Aesthetic: Most web agencies design for beauty, paying little more than lip service toward the goals of the business and its customers. Functional: In our opinion, good web design means understanding your visitors—and your business—deeply, then designing to meet both of their needs. And by “deeply” we mean not obeying an executive who says “I know my customers,” but instead gaining deep insights through extensive research. To be clear, it’s fine to optimize for beauty if your insights indicate that your visitors will buy more as a result. At that point, functional design and aesthetic design become the same thing, and you should test making your website more beautiful. The mistake happens when companies think that pure aesthetics are a substitute for research and testing. To win at this, you’ll need to make it look good, but not distractingly good. Otherwise, it’s just getting in the way of your message and offer. Tough task. And to pull it off, you’ll need to radio George Clooney for backup. George Clooney has been called many things. Pretty is not one of them. Without so much as saying a word, we perceive him as credible. It’s the same with landing page and web design. What you say (your offer) and how you say it (your copy) matters, but if you’ve got great design, you’re already winning the credibility game. Take-home message #2: Design gives you credibility before prospects ever read your copy or understand your offer. Can you create credible landing pages that convert without breaking the ad spend bank? I’m going to make some recommendations in this post, and one is to check the LeadPages template marketplace for high-converting designs. That’s a start. But what do you do when your competitor has a great design and is using killer conversion-boosting tools too? There’s only one thing you can do. No, don’t do that. Totally kidding here, legal team. But if you do want to kill the competition (metaphorically), you’ve got to show up to the fight with something they—and your prospects—have never seen before. 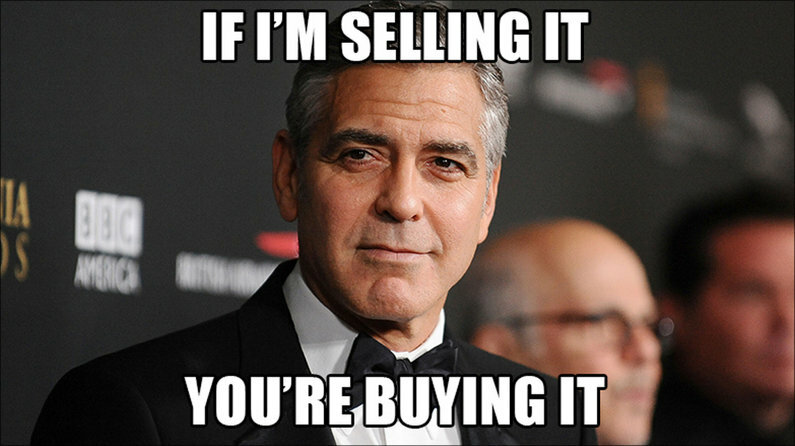 The goal of our George Clooney landing page is simple: credible design that converts. In other words, aesthetics + function. Choose a proven-to-convert LeadPages template. Decide which elements to change. Pick fonts to signal credibility. Select pictures that stir emotion. Use color psychology to select colors that convert. In the LeadPages® template library and Marketplace, you’ll see a long list of templates. The key here is to pick a template based on the conversion point in your funnel you want to optimize (e.g. opt-in page, thank-you page, sales page, webinar opt-in page, upsell, launch, etc.). For this example, let’s say we’re optimizing just your main landing page. Then you’ll click on the “Opt-In” category and sort by Conversion Rate. Select a top template that works for your business, and it’s time to customize. At the time of writing, one of the top ten converting LeadPages® opt-in page templates was the Flat UI Product Page. Since it’s a high-converting template, you can safely skip changing the layout. Also, assuming you’ve got a logo for your business, all you have to do here is swap out your logo. 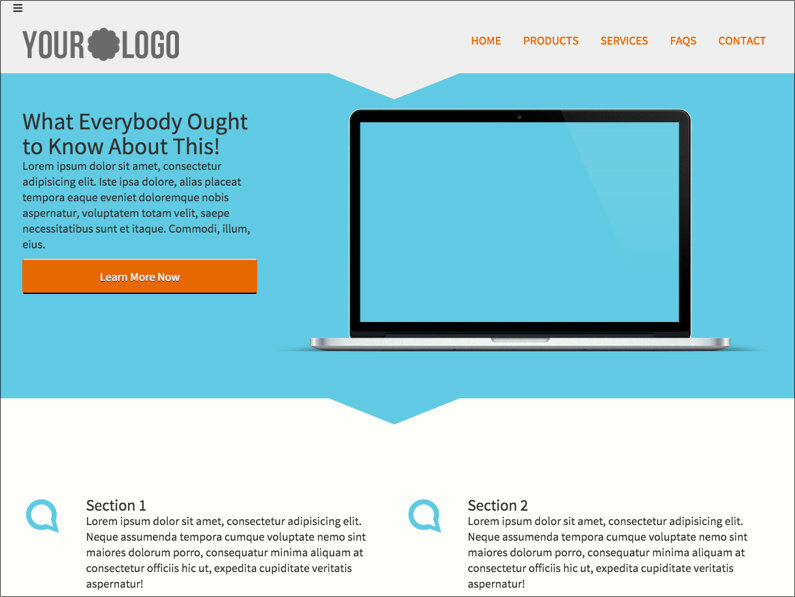 That leaves us with font selection, pictures and colors that’ll make your landing page look awesome. Let’s dive into a few resources you can use to speed up the customization process, whether you’re working on your own sales funnel or a funnel for one of your clients. Most folks use Google Fonts, since they’re built into almost every app. But the Google Font library has 676 fonts to choose from. And since we need to use at minimum a headline font and a body font, that’s a possible 228,150 combinations. To speed things up, look at the right sidebar and pick a top font. Once you do, you’ll be treated to a list of visual examples to get the creative juices flowing. And if you want to just know what works, off the right will be a list showing whether the font is used for content vs. headlines as well as the top fonts it’s usually paired with. Realistic time commitment: 2 minutes. CAUTION: Selecting visually stirring photography can dramatically increase or decrease conversions. If you’re a Facebook ad ninja, then you know how much imagery influences click-through rate (CTR). The same rules apply here. If your image offends, then there’s no surprise if it reduces your CTR. On the flip side, powerful photography has the potential to up conversions if used skillfully within your sales funnel. Our problem, though, is finding great photography. Either the good stuff costs beaucoup money or the free stuff looks way too “stock”—which kills credibility and conversions. Thankfully, there is a solution to this debacle. 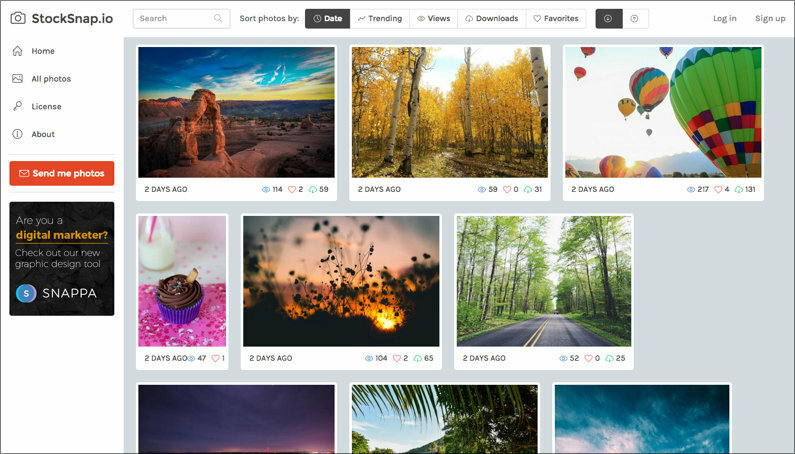 As they describe themselves: Beautiful free stock photos. Hundreds of high resolution images added weekly. All photos are free from copyright restrictions—no attribution required. I believe the scientific term for this is awesome. Of course, thousands of good images can create the problem psychologist Barry Schwartz describes in his landmark TEDTalk as the paradox of choice. To avoid getting sucked into the black hole of incredible photography, just pick one that works and move on. When you start with a source that you know has a great selection, you’ll be able to safely “outsource” your creativity and make a snap judgment on this. Editor’s Note: For another source of great imagery, keep an eye on this blog. Check out our latest image pack to download a new collection of background photos. Realistic time commitment: 2–3 minutes. Next, you’ll need to select a color based on your conversion goal and your target audience. SHORTCUT: Use this much-loved Kissmetrics infographic to select colors based on the psychological profile of your perfect customer. Consider the type of customer you’re targeting. Are they impulse shoppers? Conservative? Also, think of how you wish for your brand to be perceived (e.g. a trustworthy bank vs. a trendy clothing store). Once you’ve picked your primary conversion color, now it’s time to pick one for aesthetics. To speed through this, hop on over to Material Palette, a material design color palette generator. First, you’ll want to select the color you chose based on the Kissmetrics infographic. Then, pick a color you like or one that already matches your brand/logo. Armed with the hex codes for a whole set of coordinated colors, you’ll be able to reference and apply them when designing your page (or handing it off to a designer through the LeadPages Job Board). A layout that’s proven to convert. A logo that represents your brand. Curated fonts selected by top designers. Eye-catching photography that will draw your prospects in. 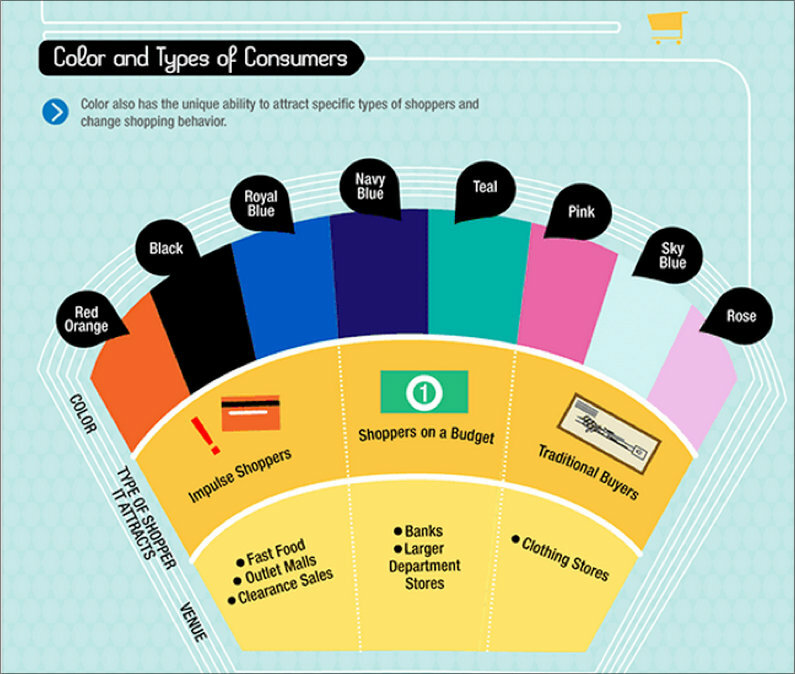 Colors that will convert your customers and make you look rather dashing. At this point, you’ve already done WAY MORE than your competition will ever do…but here’s how to go the extra mile to lead your market. Digital marketers who generate 8 figures in revenue live and die by the 3-second rule. This deceptively simple test is your first line of defense in the world of ready-aim-fire paid-media ad-spend. Before you drop $10,000 on Facebook or Google Ads, ask yourself these 3 questions. Note, however, that they don’t just apply to your copy and your offer. Modify them for design by asking whether your design highlights or hides the answers to these questions. Does the design highlight what this is? Does the design highlight what this is about? Does the design highlight what I get? As the mental lights turn on, they’ll find themselves drawn into your copy, offer, opt-in and sale. While this might be old-hat if you’re a copywriter or designer, the following test is not often used by marketers, despite its power to boost conversions. Enter retro testing—also known as talking to real people before your landing page goes live. Would you read past the first page? What was most interesting about that to you? This seemingly simple test allows for a wealth of data collection. Particularly their market’s nuanced emotional responses, which could never be captured via Google Analytics. This allows the copywriter to test an ad for the desired response before investing heavily in advertising. Designers have a similar approach. Talented web, user experience and user interaction designers often have their ideal user test their “beta” web or app design. This usability testing has everything to do with determining how well people can use the product by measuring the direct response of a user. Using careful, often recorded observation, web, UX and UI designers note where users are hesitating (an indicator of confusion) to make changes to their designs before testing again. Like copywriters, they can test for their desired response before making a larger investment. Marketers take a different approach. For buyers: What made you decide to buy? For non-buyers: Why didn’t you buy? While smaller tests are generally run off- or online before scaling up, a marketing test may require more time and revenue than a copywriter’s or designer’s test. Sit someone down in person or via Skype (screen-shared) to see the live emotional response to your landing page as it’s happening. After they’ve gone through the entire page, ask questions that copywriters or designers ask. Once you’ve gotten the green-light responses you’re looking for and performed a standard smaller-scale test, then you’ll be in a safe position to ramp up your advertising. If you’re doing it yourself:Take it step-by-step. Bookmark this page. Set just 30 minutes aside in your calendar to check out the resources and see if it’s worth your while to go it alone.If it looks like it might take more time or energy than you’ve got to invest . . . Ask your team for help.Hand this article off to someone on your team to implement it for you. Even experts in design and conversion rate optimization is always looking for handy resources to speed up their workflow.But if you don’t have an in-house design team . . . Hire a skilled designer.Post your job to the LeadPages Job Board or seek out a designer directly to help you implement the creative ideas you’ve got sparking. Don’t let a good idea go untested. It just might give you the conversion breakthrough you’re looking for.And whether you’re doing it yourself, working with a team or outsourcing it . . .
Get the 6-Point Landing Page Design Cheatsheet. I’ve made this free for LeadPages® readers so you can triple-check your design, copy and offer before you hit publish on your next landing page. And just in case you’re ever in doubt . . .